After meeting with Wall Street executives today, President Donald Trump signed a directive to begin dismantling the federal regulations enacted after the financial crisis to prevent the same thing from happening again. The end of Dodd-Frank could return the nation’s financial system to the Wild West days that prevailed before 2008—the lending environment that precipitated the Great Recession. President Trump’s sweeping directive is darkly ironic. For starters, he castigated the Wall Street players at the heart of the foreclosure crisis during his campaign. Trump once called JP Morgan Chase CEO Jamie Dimon “the worst banker in the United States.” As president, he has invited Dimon into his circle of Wall Street confidants, whom he met with on Friday. On the other hand, Trump promised to overturn Dodd-Frank from the very beginning of his campaign. So the greater irony here is that, by sweeping away banking regulations, Trump promises to punish his core supporters. The same supporters who, in part, voted him into the White House because they are still suffering from the foreclosure crisis. Voters chose Trump for somewhat incoherent economic reasons—but they weren’t wrong about feeling dissatisfied. One of the enduring mysteries of the 2016 presidential election is how Trump won on a message so focused on jobs when the economy was sparkling at near-full-employment levels. The excelsior jobs report released earlier today is a reminder of the continued resiliency of the recovery begun under the Obama administration. There are plenty of ways to explain Trump’s victory in November that hold some water—his appeals to white identity politics, an October surprise from FBI Director James Comey, interference by the Kremlin—but an unemployment crisis isn’t one of them. Another valid explanation for President Trump is to plumb the profound depths of the housing crisis. While new financial safeguards helped to restore jobs and lending, the recovery in equity lost to the foreclosure crisis has been slower. 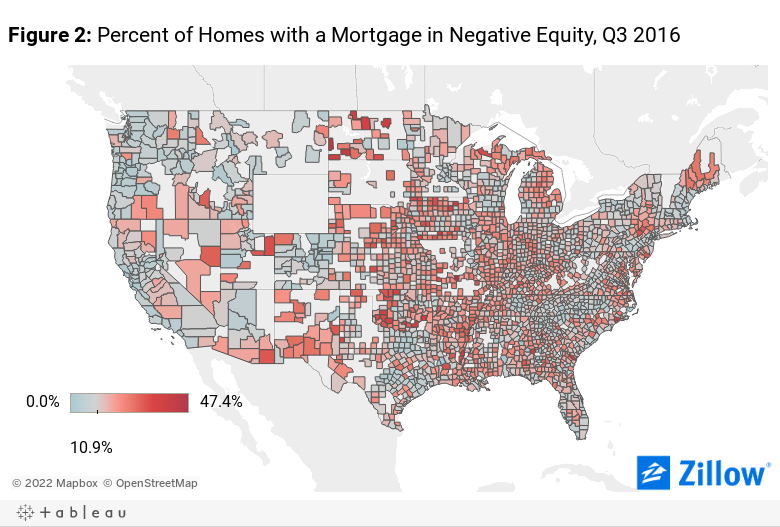 As of December, more than 10 percent of homeowners in the U.S. are still underwater on their mortgages, according to Zillow’s most recent negative equity report. That figure is down substantially from 2012, when nearly 16 million homeowners—comprising 31.4 percent of homes—owed more than the homes were worth. Circumstances have improved for homeowners since that bleak peak, but the benefit is both limited and localized. More than one-quarter of all homeowners (26 percent) have less than 20 percent equity in their homes, meaning they have not hit the break-even point where they are no longer required to pay private mortgage insurance premiums. Their equity is effectively negative. Negative equity is a function of the national economy that has extraordinary impacts on local housing markets. Phoenix, Las Vegas, and Miami, which indulged the most in the excesses leading up to the housing crisis, were typical of cities that experienced deep losses in equity early into the crisis. But as the recovery got underway and homes and housing markets regained their value, pockets of negative equity shifted from the Southeast and Southwest to the Midwest and Rust Belt. Nothing about the recovery spurred negative equity in Michigan, Ohio, Indiana, and other Rust Belt states per se. That’s not the right way to think about it. Rather, the nation suffered from staggering housing crises in places that were growing in sharp and unsustainable ways. These cities, including Las Vegas and Phoenix, rebounded quickly. Regions that were already experiencing long-term structural hardships—the Midwest, the Rust Belt—got knocked even harder on their asses. The next disaster may not take the form of mortgage-backed securities (although, why not?). It is, however, likely to set the dial back for the Midwest and the Rust Belt—places where Hillary Clinton earned the ire of voters for merely having a meeting with Wall Street bankers.